Two bettors who finally bagged the billion-peso Ultra Lotto 6/58 jackpot on Sunday night’s draw were from Albay and Eastern Samar, the Philippine Charity Sweepstakes Office (PCSO) said. 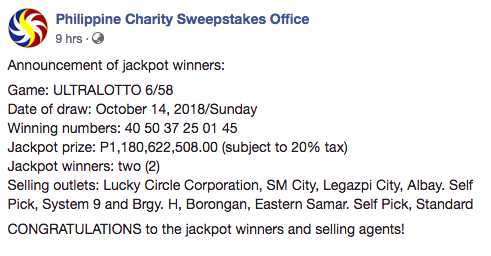 In a post on their official Facebook page on Monday, PCSO announced that the winning bets were placed on a Lucky Circle outlet in Legazpi City in Albay and a lotto station in Brgy. H, Borongan town in Eastern Samar. The two bettors, who correctly guessed the winning combination 40-50-37-25-01-45, will take share the P1,180,622,508 jackpot which is subject to 20 percent tax.